The final conference of COST Action ES1104 took place at the University of Greenwich, London, on 30 and 31 March 2016. ‘Restoration of Arid Lands and Combat of Desertification: From Science to Practice’ brought together an international line-up speakers from the ‘Drylands and Desert Restoration Hub’ to present review papers on best practice in drylands restoration and the results of recent research, in order to showcase the work which has taken place over the past four years. High-profile experts from various international bodies and NGOs were invited to take part in the panel discussions. David Finger (Reykjavik University, Iceland): Building up knowledge on resilience of fragile lands in subarctic climate. 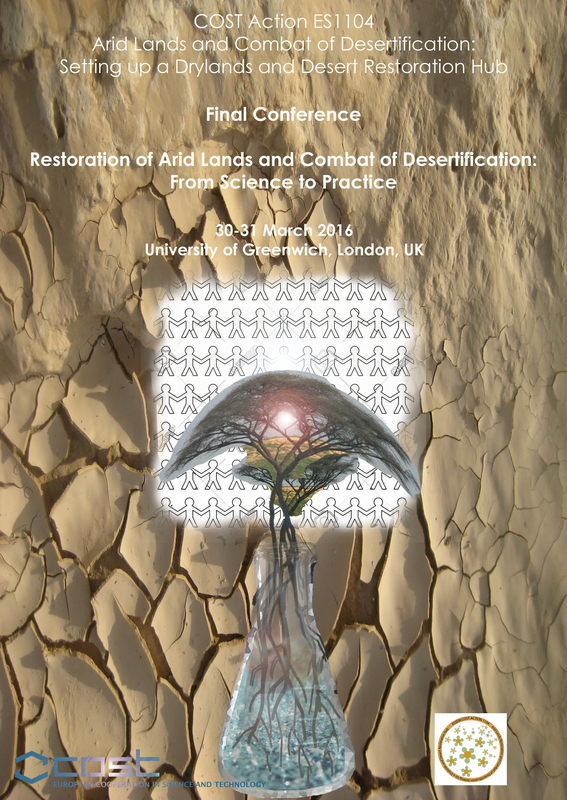 Can Sustainable Land Management Mitigate Desertification In Drylands? Abstracts must be submitted on-line by 15 November 2015. There is great need to restore existing despoiled drylands and to combat increasing desertification. Restoring habitats improves biodiversity, increases carbon sequestration, enhancing the quality of life for people. An essential measure is the planting of and reestablishment of vegetation. The successful establishment of vegetation in arid areas is complex requiring the multi-disciplinary skills of arid land experts with various capabilities, in soils, hydrology, ecology, agronomy, land management etc. However, vegetation restoration techniques in arid areas require review and development. Information on restoration is highly dispersed and often difficult to obtain. The creation of the ‘Drylands and Desert Restoration Hub’ is thus aimed to bring together the expertise, knowledge and information on vegetation establishment and management that exists in the EU and around the world. The drylands and desert restoration hub provides a focus for information for all stakeholders. The Action is devised to provide the science and practical guidance for dryland restoration and combat of desertification through coordinated data-collection with an integrated database within a harmonized information hub of current and new methods and techniques of restoration, trials and field studies, assessment indicators, academic and practical publications, and tools to identify and support practical restoration projects and decision makers in planning and restoring drylands and the combat of desertification. The Action promotes open knowledge, innovation in procedures and methods for improved restoration in dry lands. The Action; Why and What? the successful maintenance and management of planting for the long term to meet sustainable objectives for local people, the landscape, ecology and wildlife.